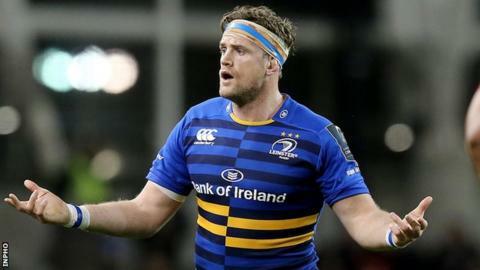 Jamie Heaslip could be a fitness worry for Ireland's Six Nations campaign after taking a bang to his head in Leinster's Pro12 win over the Ospreys. The British and Irish Lion, 32, had to go off after only six minutes and was not allowed to resume as he did not pass a head injury assessment. Blood was coming from the number eight's mouth as he came off. Defending Six Nations champions Ireland open the defence of their title against Wales in Dublin on 7 February. Heaslip is among the candidates to be handed the Ireland captaincy for this year's tournament with coach Joe Schmidt needing to appoint a new skipper after Paul O'Connell's retirement from international duty. The Leinster back row replaced Brian O'Driscoll as Ireland captain for the 2013 Six Nations and also skippered the Irish during the World Cup quarter-final defeat by Argentina last autumn when O'Connell was unavailable because of injury. Leinster's 22-9 win in Wales moved them to the top of the Pro12 table as Dave Kearney's two tries helped set up the victory.